The NCAA Board of Governors is reported to be assessing their rules after unanimously voting Wednesday to accept the recommendations of a special panel that proposed drastic changes to college basketball. 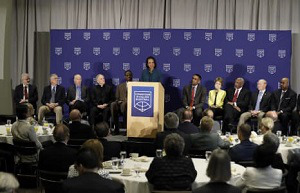 Condoleezza Rice flanked by members of the Commission on College Basketball. “The levels of corruption and deception are now at a point that they threaten the very survival of the college game as we know it. It has taken some time to get here, and it will take some time to change course,” the report said. The commission called for the end of the college players’ “one-and-done” rule, which would require the approval of the NBA and its players union. It involves the best talents in college basketball playing only their freshman season before being eligible for the NBA. If the NBA and union do not change the rule, the commission said it would reconvene to consider unilateral alternatives such as freshman ineligibility. In a joint statement issued just hours after Rice announced the recommendations, the NBA and the players’ union pledged only to continue assessing the rules. 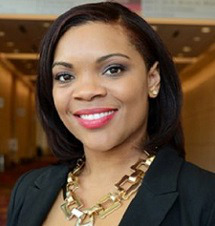 Dr. Tomika Ferguson, an assistant professor in the Department of Educational Leadership at Virginia Commonwealth University, said she was elated to see the commission’s report focus on the student athletes and on ethics. The commission also included former NBA players Grant Hill and David Robinson, former coaches, university presidents, the heads of the Association of Universities and USA Basketball and others. They did not take on the so-called “collegiate model,” but did seem to endorse the “students first” model in which students are barred from any compensation, even as college basketball has evolved into a multibillion-dollar industry. “Our focus has been to strengthen the collegiate model – not to move toward one that brings aspects of professionalism into the game,” Rice said. The commission acknowledged that the corruption it sought to eliminate arose in part due to the substantial money players generate for high school teams, agents, managers, college teams, coaches and shoe companies and how it conflicts with NCAA rules that prohibit players from taking money beyond scholarships and related costs of attending school. Rice expressed approval for providing athletes with a cut of the commercial use of their names, images and likenesses, which is currently before the courts. Dr. Robert A. Bennett III, special assistant to the executive director of the Todd A. Bell National Resource Center on the African American Male and instructor of African American Studies and African Studies at Ohio State University, said student athletes have more options. “When it comes to playing professionally, I think what many of those participating in college basketball have to do is be open to playing outside of the NBA and its G-League,” said Bennett, who also is co-editor of Black Males and Intercollegiate Athletics. “For so many guys, it’s NBA or bust. There are leagues in France, Italy, China and Greece, and they can make a good living playing there. Being able to return is also a great move. Bennett generally praised the commission’s recommendations. Both Ferguson and Bennett wonder if the proposed changes will affect other NCAA sports, including football and women’s basketball. “The push for reform with college football is long overdue,” said Bennett.